2 X 10 Victorian Floor Register - Brushed Nickel Discounts Apply ! Floor register covers with a brushed nickel finish will add that extra touch of sophistication to your rooms. This heat register comes with a fully adjustable steel damper which allows you complete air flow control. Damper can be removed if desired. These vents have a lacquer coating to protect the finish and prevent rusting. Overall size of the Victorian floor register cover is 3 1/2 x 11 1/4. Functional, stylish, and durable at a price you can afford. Actual Faceplate Dimensions of Vent Cover: 3 1/2" x 11 1/4"
Damper Dimensions: 2 1/8" x 9 3/4"
You may use Spring Clips to attach the 2 x 10 brushed nickel floor register to the wall. 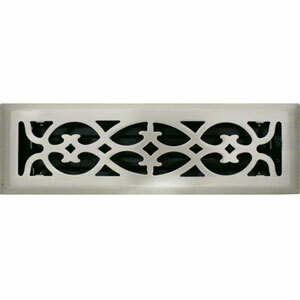 Decorative register covers are a great way to enhance the decor of any home! Call or go online to place an order today!